Hello Everyone! Happy Wednesday! I don't know about you, but I just love Wednesdays! And especially since at My Creative Time it's a 3-D Wednesday! For today's project I wanted to make something that I could give for a last minute housewarming gift. I just love Red, White and Blue and for years my kitchen/family room was Americana, so when I saw this dish towel it made me miss my old decor! Don't forget to see what my other design teammates did! This is so pretty!! What a nice gift to give!! WOW!!! I love this Liz!!! What a CUTE idea, Liz! This is just adorable! That glass glitter is so pretty!!! Liz ~ Okay this is just to FABULOUS! I have to totally agree with you about red, white and blue ~ such AWESOME colors together! I LOVE what you did with that spatula!! What a GREAT housewarming gift! Oh and LOOK at that glass glitter too! LOVE it! This is so fabulous!!! What a super, fun gift to give!!! I love, love, love it!!!!! That is gorgeous. What a nice gift to give someone. Love it. What a super cute and clever idea! 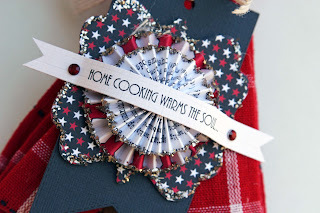 The papers and colors are perfect, and I love that rosette! I think I need to scraplift this idea! You should do a video on how you folded it. Love the bow. Just ordered some. 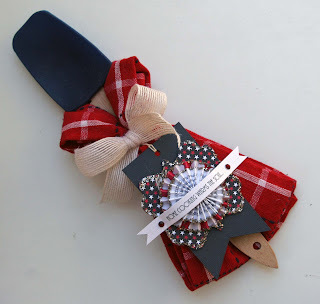 Another clever idea for a gift...this turned out so beautiful. I don't know what color your kitchen is now but maybe you can sneak a little old colors into it so you won't miss it so much. Oh my gosh, how fun would this be to give someone? I love it and I love the cute colors and rosette! Super cute idea:) TFS!!! Fabulous! What a great gift idea! Love the American theme too!